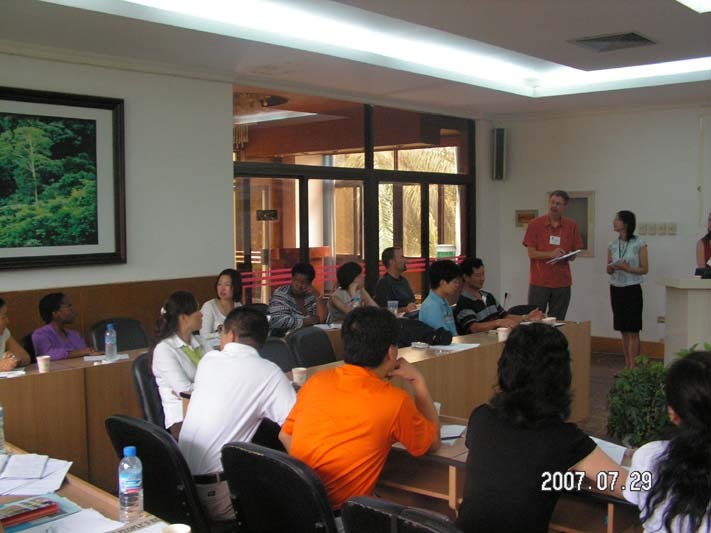 During July 27-31, a 28-person delegation (including educator from <?xml:namespace prefix = st1 ns = "urn:schemas-microsoft-com:office:smarttags" />America, South Africa, and China) of the Global Environmental Teaching 2007 visited XTBG. The visit was aimed at exchanging experiences in environmental education and increasing the public awareness of protecting the earth. Taking XTBG as the last stop for the Global Environmental Teaching 2007 in China, the delegation spent five days understanding the environmental education at the Garden. They also had field studies on the natural environment of the neighboring ethnic Dai and Jinuo villages. On July 28, Mr. Zhu Hongxiang gave detailed introduction to the public education at XTBG with a title of “Public education with a combination of biodiversity conservation and indigenous knowledge”, and the colorful ethnic culture entitled “Tropical rainforest – the origin of ethnic culture in Xishuangbanna”. On July 29, Prof. Chen Jin, director of XTBG, briefed the development of XTBG to the guests. Susan Ermer, who is in charge of the Global Environmental Education (GET), introduced the Global Environmental Teaching program. Afterwards, the two sides carried out activities based on such themes as assessment of environmental education, ways to making students more intimate with nature, nature-based environmental teaching, capacity building and sharing, further cooperation, and so on. The visiting educators were all fascinated by the rich plant diversity and wonderful landscape of tropical flavor at XTBG. They regarded XTBG as a perfect integration of magnificence and natural beauty. The Global Environmental Teaching program is organized by the Global Environmental Education Center, University of Wisconsin, Stevens Point. Since officially launched in 2004, the Global Environmental Teaching program has sponsored many activities among the educators in Wisconsin, Puerto, and South Africa. 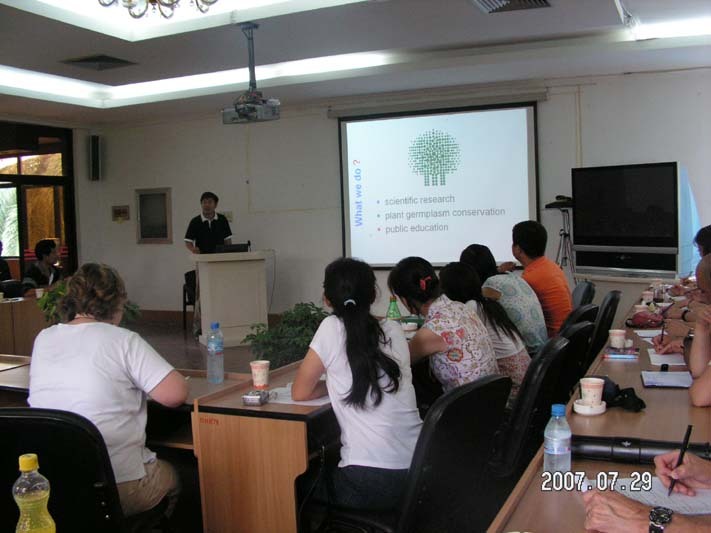 It sponsored the Global Environmental Teaching 2007 in China for the first time, which was conducted in Beijing, Xinjiang, and Yunnan. XTBG had offered warm reception and coordinating efforts for the complete success of the program in Xishuangbanna, which won acclaim from the visiting educators.